The concept of the evening comes from reflection on the twelve bunkers Mussolini ordered built in the 1930s under Rome, seen as emblems of the invisible places that exist in cities. The bunkers are a pretext to think about space as the product of political, social, cultural and mental factors. The concrete structure with beveled corners, the armored doors, the air filters that make these places impenetrable bear witness to an intensification of fear of others. The bunkers can become the vector of a theoretical reversal. Looking at them “in reverse” means imagining a convex territory, without walls, an area of sharing without limits or boundaries, an autonomous, mobile, real, existential or imaginary zone. Ensemble Vide thus moves underground and updates the problematics of the void, starting with an encounter with what is hidden. 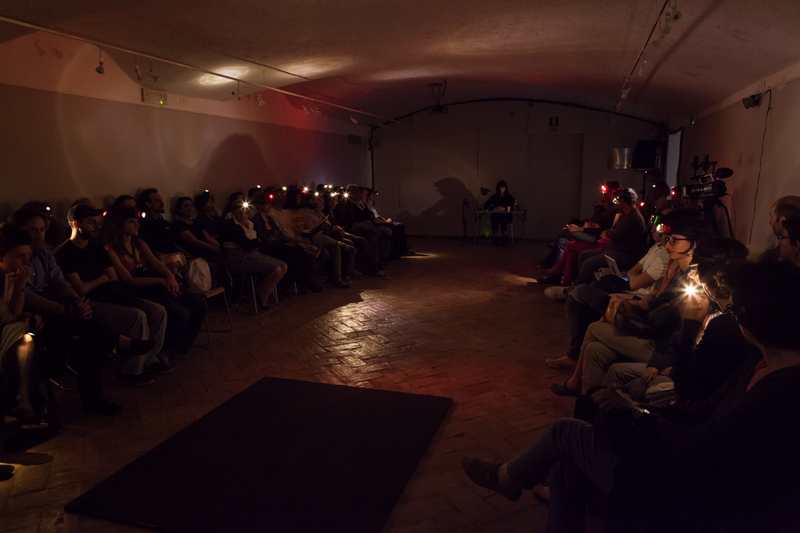 The project mixes art and science, creating new connections developed with the timing of performance: dance, music, lecture and installation meet the audience below ground level. Performers: Adaline Anobile (dance & performance), Sària Convertino (accordion), Rudy Decelière (sound installation), Lucia Piccioni (art historian). Consulting: Noémie Etienne (art historian). Adaline Anobile was born in Geneva. After taking a Masters diploma in textile design at the La Cambre national school in Brussels, in 2008 she began studying dance and choreography at the School of New Dance Development in Amsterdam, under the guidance of Susan Rethorst, Robert Steijn and Gonnie Hegger. Today she continues her research on performance and contemporary dance, developing reflections on gestures, their obstacles and their opposites, and on their relationship with duration and thought, through the immediacy of the body. In 2008 Adaline Anobile met the choreographer Martin Nachbar and collaborated on the works Living Room and Nach Hause (2011). Today she is working on a range of collaborations in the United States, Germany and Switzerland. She has received a danceWEB grant in 2010 under the direction of Sarah Michaelson and Yasuko Yokoshi, at the Festival Impulstanz of Vienna. Sària Convertino was born in Mottola in 1987. She began studying the accordion at the age of eight, and then moved on to study of the bayan with the chromatic system in 2005, under the guidance of Massimiliano Pitocco at the S. Cecilia Conservatory in Rome, where she graduated with honors in 2008. In March 2011 she took a Masters degree with honors at the same Conservatory. She has performed in concerts as a soloist and participated in many regional and national competitions, taking first place. Among international competitions, in 2003 she was selected to represent Italy at the Trofeo Mondiale C.M.A. World Trophy (junior), and then participated in Hungary at the finals, taking first place in the Coupe Mondiale Junior. She is a teacher at the S. Cecilia Conservatory in Rome, in the Pre-Academic Courses, and at the D. Cotugno music high school in L’Aquila. Rudy Decelière was born in 1979 at Tassin-la-Demi-Lune (FR), and lives and works in Geneva. He explores sound art mostly through installations, in both outdoor and indoor spaces, and in an ongoing relationship with environments, architectural elements and native soundscapes (Archipel 2003, Bex & Arts 2011, Abbatiale de Bellelay 2012, Jenisch Museum 2013). His parallel experiences as a sound engineer for film and a sound designer for interdisciplinary projects have led to multiple reflections regarding sound, its spaces and their relationships or limits with respect to music, giving rise to performances and multichannel works broadcast in specific contexts. Thanks to his experience in film, Rudy Decelière works mostly with concrete sounds, at times made abstract, testing the limits of the perceptions of the listener. An art historian, Noémie Étienne lives and works in Geneva, Zurich and New York. She wrote a doctoral thesis entitled La restauration des peintures à Paris, published by Presses Universitaires de Rennes in 2012. Her research focuses on the ties between visual culture and material culture, on the notion of the object, the relationships between theories and practices, art history and anthropology, or art, science and crafts. A co-founder of the interdisciplinary nomadic festival Eternal Tour (www.eternaltour.org), she is now planning a residency at the Cairo headquarters of Pro Helvetia. After having taken a degree in Modern Literature at the University of Macerata, Lucia Piccioni took a Masters degree in Art History at the École des Hautes Études en Sciences Sociales (EHESS) in Paris, where she is now conducting doctoral research in collaboration with the Scuola Normale Superiore of Pisa. Her research on the links between art and politics, and on the concept of the autonomy of art, focus on the identity implications of landscape and the representation of the human figure during the period of Fascism in Italy (1922-1943). She has been a researcher at the Institut National d’Histoire de l’Art (INHA, 2008-2012) in Paris, and has held various teaching positions in Art History at the Sorbonne-Paris I.